Baytown City Councilman Charles Johnson of District 3 is donating $500 to help a Lee College student fund his or her education. Johnson will award the scholarship at the Dec. 9 basketball home game as part of a raffle and half-court shooting challenge with a special twist. 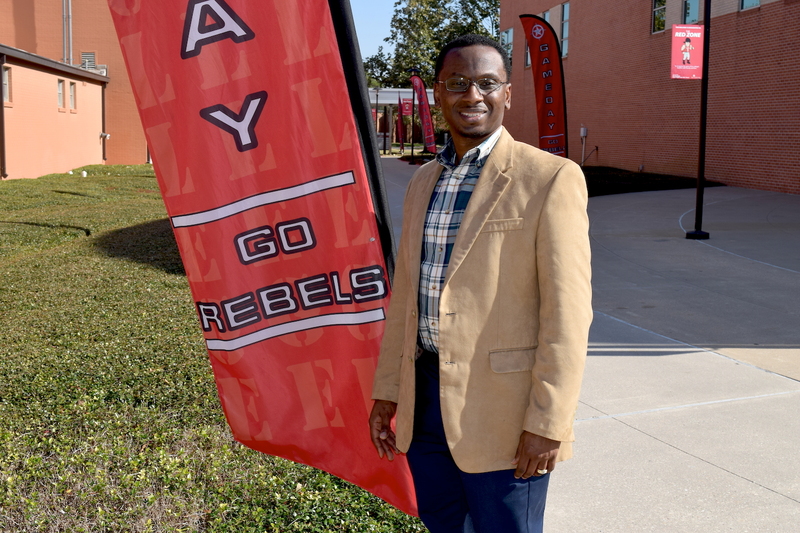 BAYTOWN, TX — One Lee College student who attends the Runnin’ Rebel home basketball game against Lone Star College — Tomball on Saturday, Dec. 9, will walk away from the Sports Arena with a $500 scholarship, courtesy of Baytown City Councilman Charles Johnson. Johnson, a Lee College alumnus who campaigned for the District 3 council seat on the slogan “We Are ‘IT’: Improving Together,” is donating the scholarship money in hopes of giving a student the boost needed to fund his or her education and improve the future both for the recipient and his or her family. “I really enjoyed my time at Lee College, learned so much and made new connections. Now I have the opportunity to pay it forward,” said Johnson, who graduated with an Associate of Applied Science degree in Alcohol and Drug Abuse Counseling and later returned to earn a credential in Child Development. His mother, Charlene Jones, is a long-time instructor of cosmetology. To be eligible for the scholarship, Lee College students must show their ID at the game and receive a raffle ticket. The student whose ticket number is called at halftime will have three chances to make a shot with the ball starting at the half-court line. No special basketball skills will be necessary, however, because of a surprise twist that Johnson will reveal during the scholarship presentation. The winning student can be enrolled in any Lee College degree or certificate program, and use the scholarship to pay for any educational needs — whether tuition, textbooks, classroom or laboratory supplies or something else entirely. Johnson said he did not place any stipulations on how the money should be spent, because he understands that unexpected situations can arise. The Runnin’ Rebels will tip off against Lone Star College – Tomball at 6 p.m.
BAYTOWN, TX — What started as a joint effort between Lee College and the city of Baytown to pack the house for Runnin’ Rebels Basketball ended last weekend with more than 900 fans rocking their red and filling the Sports Arena to cheer on the team against a conference opponent. Along with the action on the court between the Runnin’ Rebels and the Angelina College Roadrunners, fans at the first-ever “Pack The House, Rock The Red” game enjoyed a lively atmosphere that included games, contests, music, raffle giveaways and the chance to sink a half-court shot for a $500 prize. All attendees aged 18 and under received free entry into the game, as did anyone who brought two canned goods to contribute to the team’s ongoing drive to feed the hungry in the local community. Attendees aged 19 and older received discounted $2 entry for wearing red. Head Coach Roy Champagne thanked Kevin Troller, assistant city manager for the city of Baytown, for envisioning and promoting the campaign to sell out the Sports Arena in support of Lee College basketball. “He simply was a fan that felt we had a good product in a great venue,” said Champagne, who has coached the Runnin’ Rebels for more than two decades and made it a priority for his athletes to give back to and connect with the community. The team has completed more than 530 hours of community service since August 2016 and donated thousands of canned goods to local food pantries. Next up, the Runnin’ Rebels will hit the road for an away game against Jacksonville College before returning to the Sports Arena Wednesday, Feb. 8, to take on Blinn College. Tip-off is set for 7 p.m.
A full schedule for the 2016-17 basketball season and a team roster are available online at www.lee.edu/athletics/basketball. BAYTOWN, TX – As Baytown natives who grew up playing in local youth basketball leagues and thrilling fans on the court as Goose Creek Memorial High School Patriots, Lee College Runnin’ Rebel Basketball teammates Javonte Cooper and Julian Powell can easily find common ground with the children they meet and mentor in the community. Now in their redshirt sophomore seasons with the Runnin’ Rebels, Cooper and Powell are looking forward to reaching their own goal of advancing their basketball careers at an NCAA Division I college or university. Both have battled to earn playing time on a talented team and mastered the more complicated schemes and game plans used at the collegiate level. 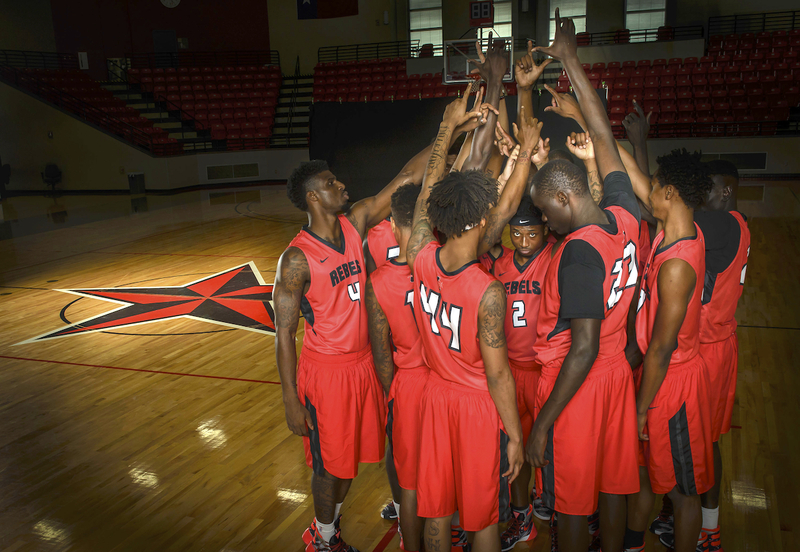 Their hard work will be on display this Saturday, Jan. 28, when the Runnin’ Rebels take on Angelina College at the Sports Arena on campus. The team is hoping fans will “Pack the House” and “Rock the Red” for the game, filling the 1,500-seat arena and helping collect thousands of canned goods to feed the hungry in the local community. All fans 18 and under will receive free entry, along with anyone who brings two canned goods. Fans aged 19 and older that wear red will pay $2, while those who do not wear red will pay $5. Tip off is at 6 p.m.
Moving on to a bigger and better basketball program will likely also mean moving away from Baytown, where Cooper and Powell have been able to enjoy the comforts of home and familiar surroundings while adjusting to the rigors of life as a college student-athlete. In addition to a full slate of classes, practices and games, the Runnin’ Rebels have completed more than 530 hours of service to the local community since August. Cooper is also a founding member and president of Reaching Excellence Against Limitations (R.E.A.L. ), a student organization that aims to educate and empower black males on campus. But creating a brighter future for their families is also why chasing the dream of a professional basketball career is so important. Lee College Runnin’ Rebels Basketball players Roc Johnson, KaJon Brown and Javonte Cooper serve free dinners to neighbors in need at Curt’s Kitchen, a ministry of Cedar Bayou Grace United Methodist Church, during a visit in August 2016. The team has completed more than 530 hours of service to the community since then and donated more than 6,000 canned goods to local food pantries since the 2015-16 basketball season, and is now looking for fans to “Rock the Red” and bring even more canned goods to the home game set for Saturday, Jan. 28. BAYTOWN, TX — Between the classes, practices and games that fill their busy weekly schedules, the Lee College Runnin’ Rebels Basketball Team has made it their mission to roll up their sleeves and get to work helping others in Baytown and beyond — completing more than 530 hours of community service since August 2016, and donating more than 6,000 canned goods to local food pantries in the last year alone. To Head Coach Roy Champagne, volunteering their personal time to support worthy causes is an essential responsibility of being a Lee College student-athlete. The Runnin’ Rebels have visited six elementary schools in Baytown and Highlands to speak out against bullying and encourage kids to be great students and avid readers. They’ve cheered for young athletes at youth basketball nights and team try-outs. They’ve pulled on aprons and plastic gloves to dish up free dinners at Curt’s Kitchen run by Cedar Bayou Grace United Methodist Church. They’ve delivered thousands of canned goods to food pantries at St. Paul’s Lutheran Church and the Missouri Street Church of Christ, among others. And they’re mentoring students at Charles R. Drew Elementary School in Barrett Station, which the college has adopted as part of its Cradle to Career Network. Now, the team is asking the community to join their efforts at the home game against Angelina College, which is set for a 6 p.m. tip-off on Saturday, Jan. 28, at the Lee College Sports Arena. Fans aged 19 and older who bring two canned goods will be given free entry in exchange for helping the team reach its goal of collecting 20,000 canned goods to help feed the hungry in the local community. The Runnin’ Rebels hope to pack the 1,500-seat arena for the game against the Roadrunners and are encouraging all fans to “Rock the Red” and show their spirit. Additional information about “Rock the Red” is available online at www.lee.edu. 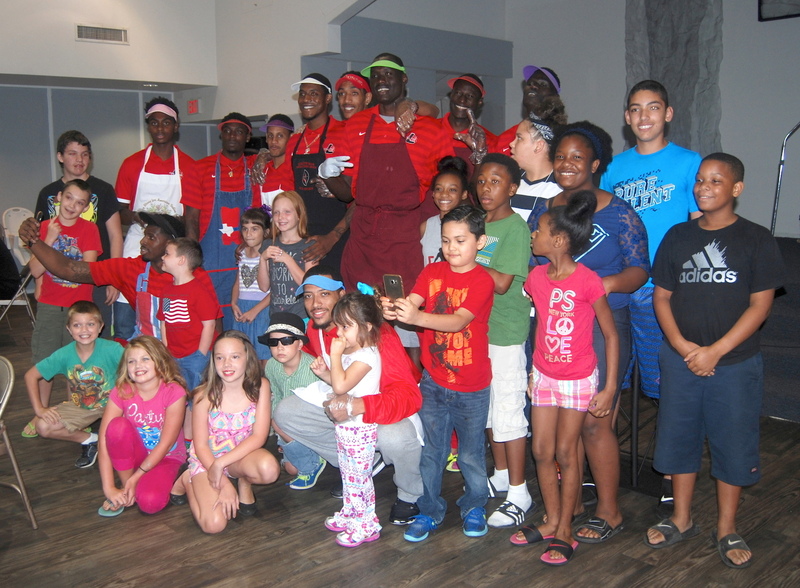 Members of the Lee College Runnin’ Rebels Basketball Team spend time Wednesday, Aug. 4, 2016, with children at Curt’s Kitchen, a ministry of Cedar Bayou Grace United Methodist Church in Baytown that provides a free weekly dinner to people in need. The team volunteered to assist with serving the meal and also donated 600 canned goods to the ministry as part of ongoing efforts to give back to the community. BAYTOWN, TX — Members of the Lee College Runnin’ Rebels Basketball Team recently tied on aprons and pulled on plastic gloves to help Cedar Bayou Grace United Methodist Church serve barbecue sandwiches with all the trimmings to people in need in the Baytown community. The student-athletes also gave 600 canned goods to Curt’s Kitchen, the church ministry that feeds the hungry every Wednesday at the Coat of Many Colors in Baytown. The Runnin’ Rebels have donated 3,000 canned goods to numerous churches and local food pantries since the summer began, and more than 6,000 canned goods since the start of the 2015-16 basketball season. “It’s important for our guys to be a part of the Baytown community,” said Head Coach Roy Champagne, who joined his players on the serving line at Curt’s Kitchen and invited the diners to attend an upcoming basketball game on campus for free. The 2016-17 basketball season begins in November. As some players scooped up potato salad and passed out homemade desserts, others filled up glasses of tea for the Curt’s Kitchen patrons and assisted the ministry volunteers by washing dishes and helping to clear tables. Children got high-fives from the team, asked questions and posed for photos with their favorite players. The Lee College Runnin’ Rebels Basketball Team donned aprons and plastic gloves Wednesday, Aug. 4, 2016, as volunteers at Curt’s Kitchen, a ministry of Cedar Bayou Grace United Methodist Church in Baytown that provides a free weekly dinner to people in need. The student-athletes also donated 600 canned goods to help keep the ministry’s shelves well stocked for its patrons. 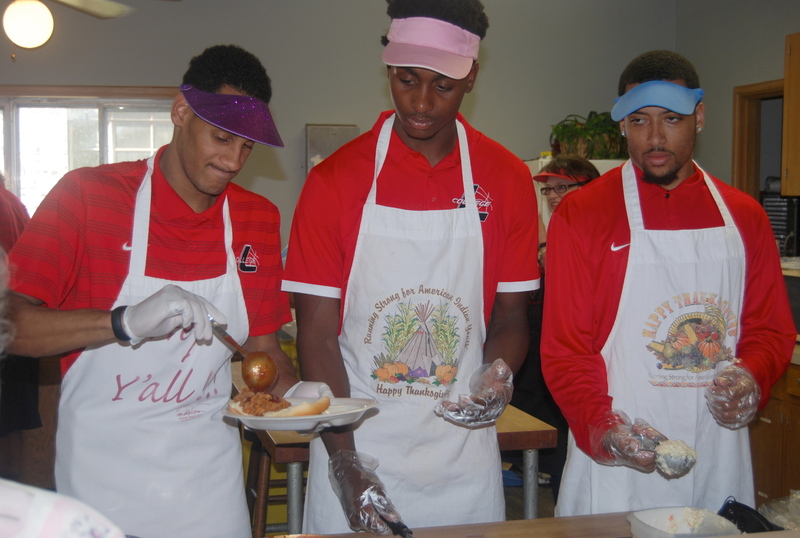 Pictured on the serving line, from left: Roc Johnson, Julian Powell and Javonte Cooper. Nita Davis, who coordinates Curt’s Kitchen for Cedar Bayou Grace, was impressed by the team’s generosity and willingness to share their time with the more than 100 people served by the ministry each week. In addition to dinner, the church also provides daily sack lunches to children in the neighborhood who would otherwise be unable to eat during summer break. The ministry works strictly on donations. Sophomore guard Tim Coleman (center) is among the standout players on the Lee College Basketball Team, which will face off Saturday, Nov. 7, against Houston Community College-Southwest in the second home game of the 2015-16 season. Rebel Nation, formerly known as Former-LEE, is sponsoring a free tailgate party to be held from 3:30-5:30 p.m. before the Runnin’ Rebels hit the court. The tailgate is free and open to the community. 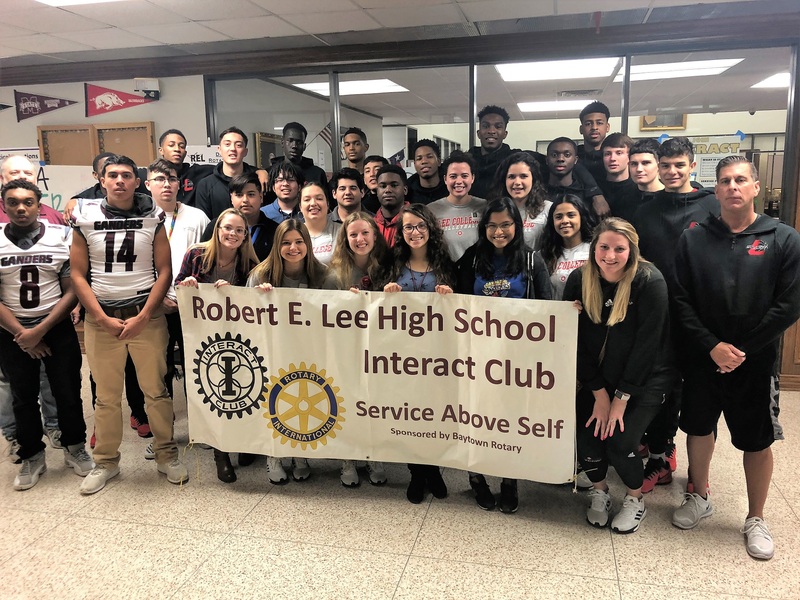 BAYTOWN, TX – The Lee College Basketball Team has devoted itself to community service in the past year, visiting with elementary school students around the city of Baytown. 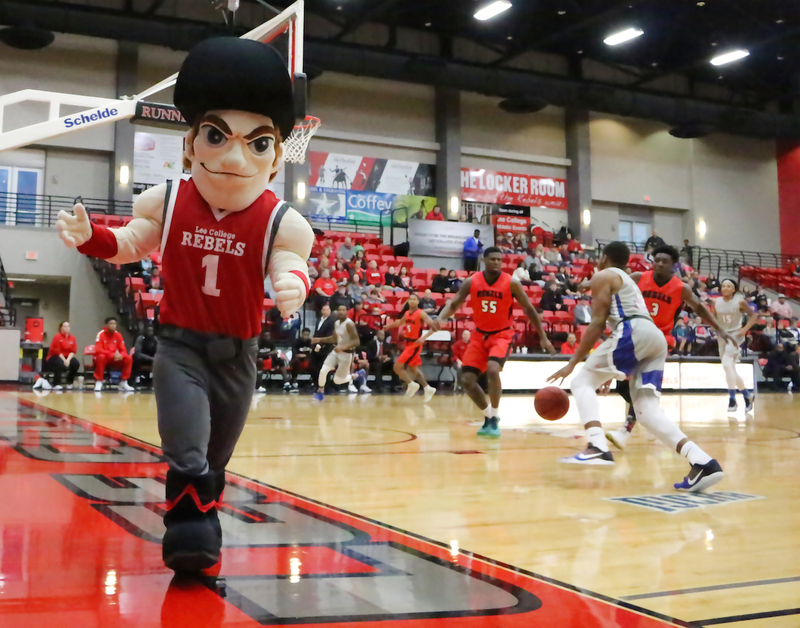 Now, the Runnin’ Rebels are inviting the community to return the love this Saturday, Nov. 7, at the free Red Zone Tailgate Party before their home game against Houston Community College – Southwest. The tailgate party will be held from 3:30-5:30 p.m., in the Friends of Lee College Mall area behind the Sports Arena, with a rain location in the auxiliary gym. Rebel Nation, formerly known as the Former-LEE alumni association, is sponsoring the event as an ideal afternoon for the entire family. Those who attend will also receive free admission to the basketball game at 6 p.m.
Tailgate partiers will enjoy free food and drinks, and face-painting for the kids. Local high-school athletes will participate in a 3-point shootout contest, and Runnin’ Rebels fans will have the chance to get autographs from their favorite players before they hit the court. The Lee College Basketball Team has a long history as a breeding ground for top talent from around the United States and even abroad. Under the leadership of head coach Roy Champagne for the last 23 years, more than 100 Runnin’ Rebels have moved on to play at the NCAA level in programs at universities like Baylor and Virginia Tech. Some of the former Runnin’ Rebels have also built professional basketball careers overseas.